Androgens play a pivotal role in the embryonic development, growth, and function of many tissues within male species. The cells of these tissues are influenced by androgens through the binding and resultant conformational changes in the androgen receptor (AR). The importance of the role played by ARs in the life of androgen dependent tissues is evidenced in the genetic diseases that produce alterations in the AR, resulting in alterations in the male phenotype. Most of the available knowledge regarding the function of androgens and the role of AR has been obtained from studies of the prostate gland. These studies have elucidated the importance of androgens in the maintenance of homeostasis. The prostate provides a physiologic tissue model of AR action. 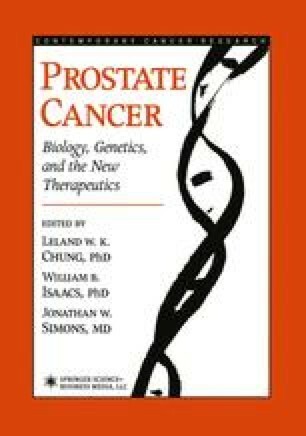 The study of prostate cancer also provides a pathophysiologic model for the investigation of androgens and AR. Androgen ablation therapies in prostate cancer take advantage of the continued requirement of the androgen-AR relationship in the immortalized tumor cells. Unfortunately, these therapies often fail with time, and the disease progresses to an androgen refractory and/or androgen independent stage. Recent studies have begun to pull back the veil regarding the pathophysiology of these refractory cells and the role of AR in their growth.